This weekend Christmas was officially welcomed into my home. At the Ready-Nelson Ranch we have a strict no Christmas before Thanksgiving policy, so on Friday morning my mom and I tackled the interior of our houses and my dad and April the pup tackled the exterior. We started the morning at my house after some breakfast, french press and an episode of The Pioneer Woman. Our first task for the day was to set up my pre-lit slim Christmas tree that I got from some of my cousins last year. They gave it to me last year right before Christmas, but since I have only been in my house a month I decided to just set up the small table top tree I had and wait to go big this year. So big we went. While setting up the tree we had to play with some of the lights a bit because there were a few shorts, but once we got them all going and added a few additional strands of lights we were on a roll. Sometimes being an interior designer is a blessing and a curse. I always tell people that I might not always know what I like, but I do know what I don't like. This was different though, I knew what I wanted and am thrilled to say that my vision and ideas came together nicely. Simple was the name of the game for me, as is the case most of the time, and so we started with the burlap to give us a nice base. From there I set out to make the bow and add the ornaments and berries. While shopping I couldn't decide if I wanted silver or gold and was thrilled to find this combo of both. There are still a few ornaments I want to make, but for this being my first tree I am thrilled with the way it turned out. Some of my favorite Christmas pieces are ones that were either handed down to me or I found with family and friends. The little tree on the counter has spent time in Tennessee while my brother was in the Army and San Marcos where I went to school. I am happy to have it in my kitchen because it reminds me of the Christmas in Tennessee before my brother left for Afghanistan and then the next when he got home just a few days before Christmas. It brings back sweet memories of my college roommates and I laughing over it in our apartment. You could say that tree has some history. The nutcracker next to it was a gift from my dad the year I got certified in scuba diving. My sled and JOY sign are new additions this year and I was thrilled with each find. While I was in Missouri in October with Jessica we went antiquing one afternoon and I was thrilled with finding this sled. I knew that I wanted a winter type toy that I couldn't find in Texas and this sure fit the bill. It adds so much character to my living room and will be fun to style in different ways for years to come. I found the JOY sign at Michaels with my mom and could not pass it up! The chalk board is from my mom's childhood and was part of a desk she once had. I recently pulled it out of their attic and cleaned it up a bit to bring some joy into my home. It brings a smile to my heart and I know it does my mom's too to see her childhood memories brought back to life. Last year my outdoor Christmas lights were colorful, but there just weren't too many of them because I literally hung them the night before the ice storm came last year that shut down all of north Texas. To say the least, I stepped up my game and doubled my lights and am thrilled that they are not only on the fascia, but also on the columns. The colors and that gigantic red bow on my front door make me really happy! At the end of the day my business card and college diploma both day interior design, so I love to get to decorate my home for the seasons, especially Christmas, but I will be the first to tell you that it is so much more than trees and sleds. Christmas is first and foremost about our Savior's birth and all of the glitz and glam comes secondary. I love getting to share this holiday and Christ's love with the ones I love and am so happy to be sharing my home and some Christmas joy with you today! 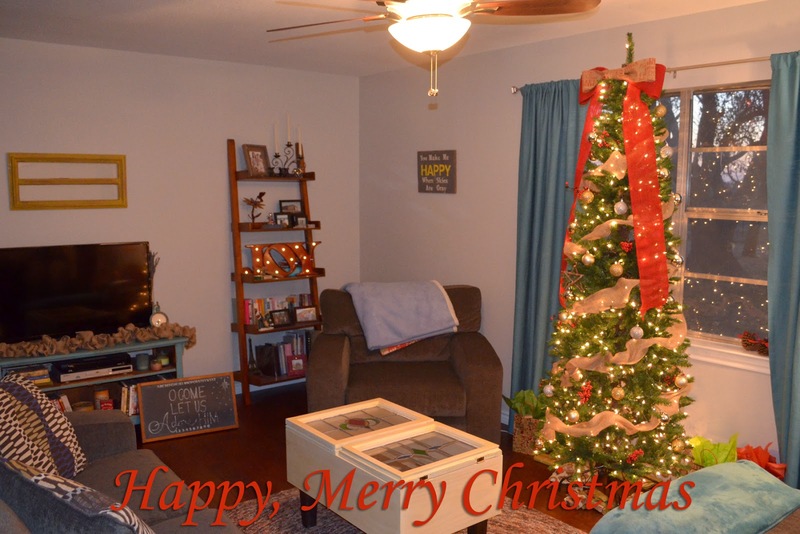 Today I'm linking up with Andrea at Momfessionals for Christmas home tours! Everything looks beautiful, dear Lauren :) My husband, son, and I will get our Christmas tree this Saturday - yay! Hugs to you, sweet friend! I broke my rules this year and did it before we left for Michigan (for thanksgiving)...but we still need our tree! 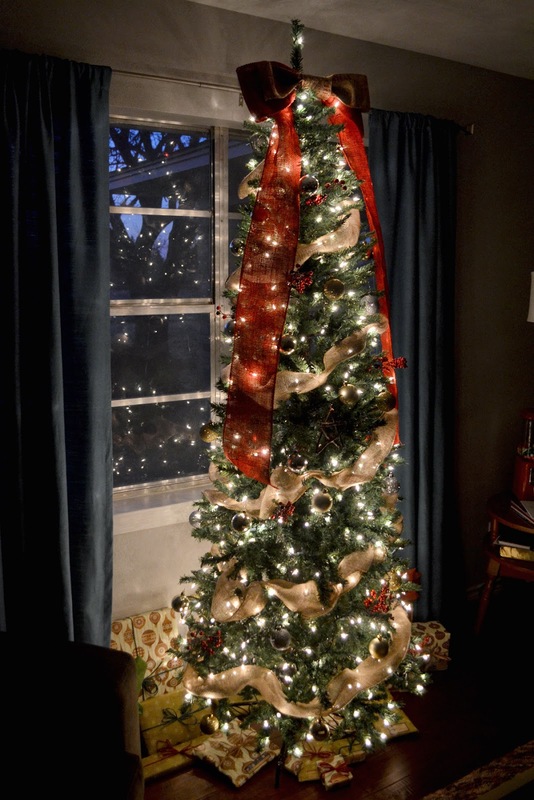 Your tree looks beautiful!! Our memories are on our tree and I always love thinking about where each ornament came from when we decorate! Your Christmas tour is so cheerful and happy! Thanks for sharing! Merry Christmas! It looks awesome Lauren! I love the tree! It fits perfectly in that window! I love the vintage chalkboard and antique sled!! Isn’t Pioneer Woman the greatest? 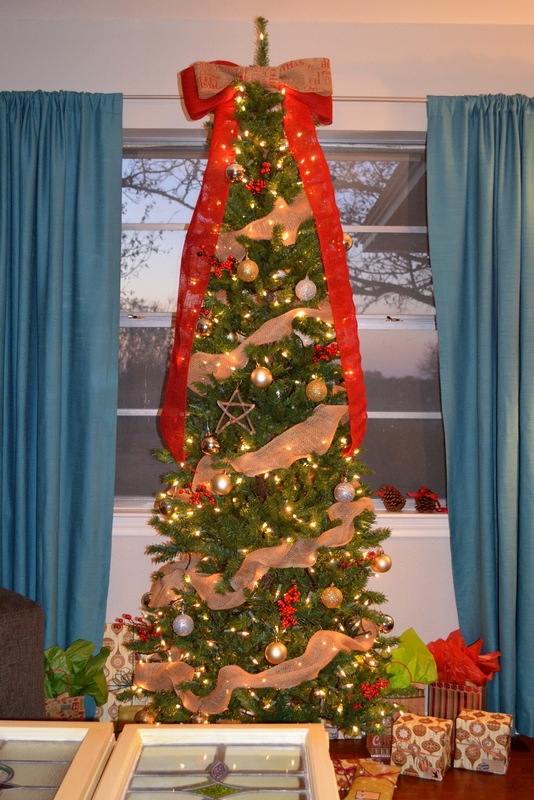 I love your slim Christmas tree. My aunt and I were just talking about how much we love the slim ones. So cute! And I love the way you decorated. Everything is precious! Stopping over from Kelly's Korner! I, too, love putting out Christmas decor from family and friends. If you get a chance, stop by #36. I'd love to have you over! I really love your big red bow tree topper. I still haven't found a tree topper I like for us and this really appeals to me.